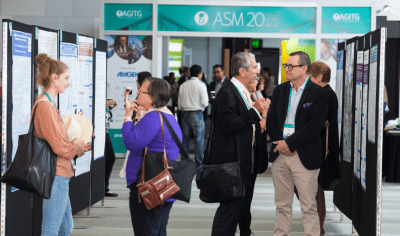 The 20th AGITG Annual Scientific Meeting was held at the Brisbane Convention and Exhibition Centre from 31 October-2 November. Cutting-edge GI cancer therapies and treatments were key points of discussion at the meeting. Invited speakers shared insights on topics as diverse as molecular pathology, understanding molecular and immunological targets, the microbiome, variations in treatment around the world, and how to interpret data as statistically or clinically relevant. The program was balanced between education around multidisciplinary controversies and AGITG trial updates. The Principal Investigators of AGITG trials updated the group on our current research. New research included the DYNAMIC studies, which are analysing the potential of circulating tumour DNA in GI cancer. Another new trial presented was the MODULATE study investigating whether immunotherapy could be used to treat colorectal cancer. In upper GI cancers, the MASTERPLAN trial investigating stereotactic body radiotherapy in pancreatic cancer was presented. It was exciting to see so much progress in a wide variety of therapeutic areas. The New Concepts Symposium was a stimulating forum for robust discussion and development of research concepts. Ten concepts were submitted this year of which four were chosen for presentation. Dr Lorraine Chantrill was presented the Best New Concept Award sponsored by Specialised Therapeutics for her concept titled, A pilot feasibility and discovery study of neoadjuvant FOLFIRINOX followed by immunotherapy for resectable adenocarcinoma of the pancreas. The Joint Consumer and Study Coordinator Forum was another highlight. There were presentations on liquid biopsies, rare cancers, a day in the life of a trials manager, and health economics. We also heard about how tele-trials are reaching rural patients and how financial toxicity means that out of pocket expenses may influence treatment decisions. The Trainees Workshop on Wednesday was a unique opportunity for early career professionals to meet with senior and successful medical, surgical and radiation oncologists who have followed varied paths to their current positions. It explored the many different opportunities available to trainees and how to navigate them. The John Zalcberg OAM Award for Excellence in AGITG Research to Professor John Simes in recognition of his significant and outstanding leadership contribution to AGITG research. His involvement commenced in 1991 when the AGITG was a network of interested Investigators that came together to develop and conduct clinical the first trial in gastro-intestinal cancer, operating under the auspices of the NHMRC Clinical Trials Centre at the University of Sydney. He was a founding member of the AGITG Board and has served on many committees. The AGITG Innovation Fund grant of $200,000 to Professor Janette Vardy and co-investigators for “Oxtox: Can Oxaliplatin dose reduction and neurotoxicity be reduced with ibudilast in people with metastatic colorectal cancer – a phase II randomised study”, award accepted by Dr Christina Teng. The Merck-AGITG Kristian Anderson Award, to Dr Rosemary Habib, receiving one year’s funding for her PhD research project entitled “Chimeric Antigen Receptor T-cells Targeting Colon Cancer”. Best New Concept Award to Dr Lorraine Chantrill for “A pilot feasibility and discovery study of neoadjuvant FOLFIRINOX followed by immunotherapy for resectable adenocarcinoma of the pancreas”. Best Poster to Dr Belinda Lee for ”Pancreatic Cancer: An analysis of ‘Real-World’ stent-related morbidity in the palliative setting”. Best Fast Forward Award to Dr Hui-Li Wong for “Biomarker testing and biomarker-directed treatment utilisation for metastatic colorectal cancer in Australian practice”. The AGITG 2018 Outstanding Site Award to the Olivia Newton-John Cancer Wellness & Research Centre. The Dinner also held the eventful AGITG debate, where teams from Australia and New Zealand were battling over the topic ‘Prevention is better than cure’. The night finished with fierce competition as our international guests became tribal leaders in ‘AGITG Survivor’. The high spirits and good nature of the invited faculty made the night a standout. It was Professor Eva Segelov’s final year as Meeting Convenor and she was recognised for the passion and energy she has brought to the Meeting as Convenor since 2015. We welcomed Dr Lorraine Chantrill as the incoming Convenor for 2019 and beyond. Over 350 delegates attended the Meeting this year, a record number for the AGITG. The energy and collegiate atmosphere was evidence of the passion of the GI cancer research community which the AGITG is proud to cultivate.